Leverage allows our investors to invest in DARWINs without putting up the full amount. Doubling your leverage means that you'd be able to invest 2000 $ with a 1000 $ deposit. However, when investors invest is many uncorrelated DARWINs simultaneously, the risk of their portfolio can get reduced significantly due to the diversification factor. As you very well know, the lesser the risk the lesser the potential returns and that is the main reason why we have allowed our investors to activate this option. Our way to do this is letting investors invest up to double the funds they have available. How to activate investor leverage for your portfolio? 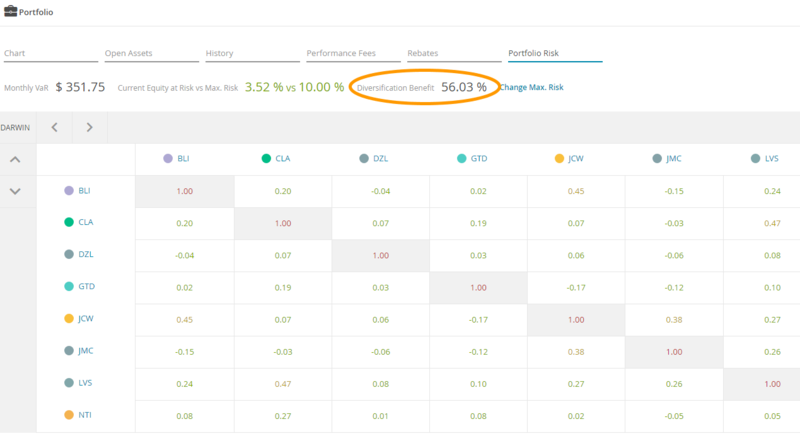 You can activate investor leverage from the Charts tab of your investor portfolio. In case of doubt, you should not enable leverage on your portfolio as it can't be disabled once has been enabled. Investor leverage applies to the whole portfolio. Once it's been activated, it won't be possible to invest in some DARWINs with default leverage and in other DARWINs with double leverage. After activating your investor leverage, you'll note that you'll have as "Available to invest" double the amount you have as "Available". Doubling your leverage means that you'll be able to invest 2000$ using up only 1000$ of available funds. What happens to investments made before activating investor leverage? Investments made before activating the double leverage will keep being invested with default leverage until you sell them. The "Leverage" column in the Open assets tab will indicate which investments have been made with default and which have been made with double leverage. This column also indicates how much of your available funds was used for each investment. When leverage is 1, the whole invested amount came from your available funds. When leverage is 2, only half of the invested amount came from your available funds, the other half is leverage. How can you know if the leverage has already been activated for in your portfolio? After activating investor leverage, the "Available to invest" label will appear next to the "Available" label. Your "Available to invest" will reflect double the amount of your "Available".